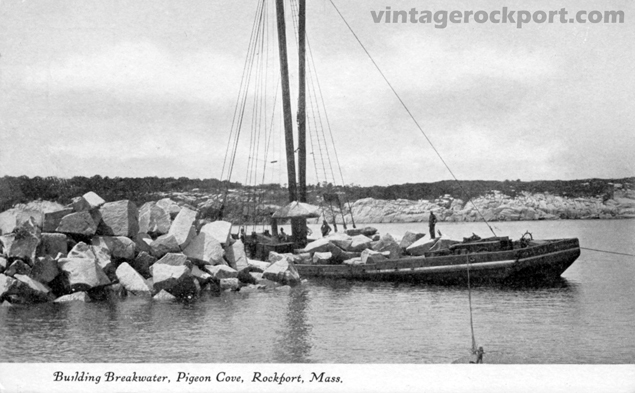 Given how quaint and quiet a town Rockport is, it is ironic to look back at the building of the Sandy Bay breakwater, which many townspeople believed would make Rockport a major East Coast center for transatlantic travel and commerce. As I’ve written before about the breakwater, Congress in 1882 approved plans to dump tons of granite in Sandy Bay and build a breakwater that would form a 1,600-acre harbor. It would be the biggest harbor in North America and the second largest in the world. But in 1916, with two-thirds of it built, construction was abandoned. Today, the breakwater remains as a curiosity and nautical hazard. That something big is doing, in the way of the development of Rockport as a terminal for transatlantic liners and transcontinental railroads, the majority of the citizens of this town firmly believe. Ever since the construction of the breakwater was begun 15 years ago the citizens have been firm in their belief tha the town was destined for big things. The breakwater, when completed, will make Rockport one of the largest artificial harbors in the world. It will enclose nearly 1500 acres of water of an average depth of 40 feet, into which the largest shipping afloat and whose construction is contemplated can steam directly from Europe almost to the very wharves of the town without encountering any obstacle. It would be unnecessary to slacken way or to wait for favoring high tide until the ship reached the pier. The Rockporters confidently believe that these advantages will be availed of making the journey from Europe to this country one day shorter than if the voyage is continued to New York. Here passengers and freight could be transshipped to the railroads and whisked across the country to their homes and destination, saving time and money. Another article, from the June 23, 1909, Boston Daily Globe, quotes Rockport Postmaster William Parsons, who everyone called “Uncle Billy,” the article said. Yes, siree. I’m one of those chaps who think that Rockport is going to be the greatest port on the north Atlantic coast for European traffic. Why shouldn’t it be? Haven’t we got right down at our wharves from 30 to 80 feet of water at low tide? Can’t the biggest liner ever built come right in here under her own steam, tie up to her dock, back out, swing around and go to sea without the aid of a tug? Sure she can. Now that means a whole lot to steamship people, don’t it? Course it does. It saves expense. Ain’t that what business men are looking for all the time? This postcard was published sometime before 1907. No publisher is identified and the card has no postmark or writing on the reverse. This entry was posted in Uncategorized and tagged Breakwater, Folly Cove. Bookmark the permalink.